Substitute Included Tray With: No Substitution. I'll Keep the Standard RAM-234-3 Tough Tray. RAM-234-6 Select Netbooks & Tablets With Case [Subtract -$14.50] RAM-246U 4.75" Sq. VESA 75/100mm Hole Pattern [Subtract -$25.20] RAM-2461U 3.68" Sq. VESA Plate 75mm Hole Pat. [Subtract -$28.65] Remove RAM-234-3 Tough Tray for Credit [Subtract -$36.60] Remove RAM-234-3 & RAM-202U for Credit [Subtract -$45.60] Contact Me - I Need Help Finding a Tablet Cradle. Click on the tabs directly above for Technical Specs and Product Options. FREE DOMESTIC GROUND SHIPPING AND LAPTOP ACCESSORY! NOTE: This base WILL NOT FIT 2014 or newer models. If you do not see your vehicle listed contact us or complete the product inquiry form by clicking here. NOTE: Click here for Airbag Safety and RAM Mounting Systems. NOTE: For the vehicle base only see the RAM-VB-159 by clicking here. Special Requirements: Bucket seats only. Call/email about bench seats. NOTE: Manufacturer components can change without notice. NOTE: Click the links below for pictures and detailed part information. Tough Tray: RAM-234-3 spring loaded expandable tray. Accommodates laptops from 10-16 inches wide (screen sizes up to 17 inches). 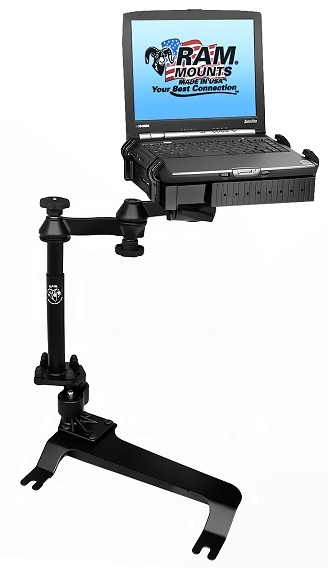 NOTE: RAM Mounts Recommends the optional RAM-234-SNMU Secure-N-Motion kit if the Tough-Tray is intended to hold a laptop or device while the vehicle is in motion. NOTE: The RAM-234-6 fits smaller devices and can be substituted. 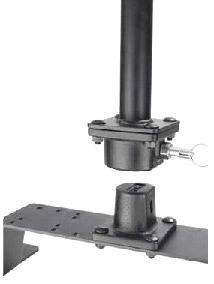 Swing Arm: RAM-VB-110-1U dual swing arms provide 12 inches of total horizontal extension. Upper Tele-Pole: RAM-VP-TTM8U 8 inch male upper tele-pole. Lower Tele-Pole: RAM-VB-TBF9U 9 inch female lower tele-pole. 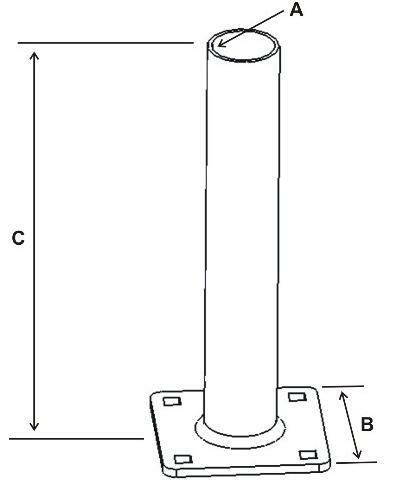 NOTE: Tele-poles feature a telescoping vertical height adjustment range from 12 to 18 inches. Vehicle Base: RAM-VB-159 no-drill base for the specified vehicles. NOTE: Manufacturer specifications can change without notice. 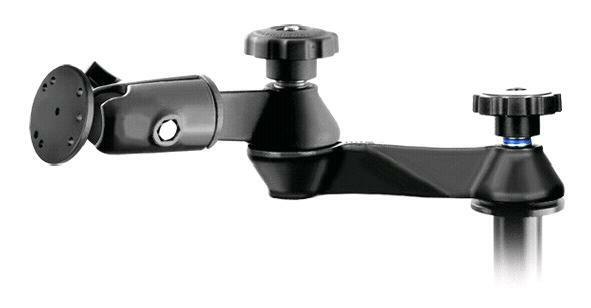 Material: Black powder coated steel with composite Tough Tray. Seat Configuration: Bucket seats. Call/email about bench seats. Installation: No-drill installation. Attaches to existing seat studs. Mount/Base Placement: Passenger side floor board, in front of seat. NOTE: Vehicle base will limit seat travel. Adjust-A-Pole: Includes RAM-VB-ADJ1. 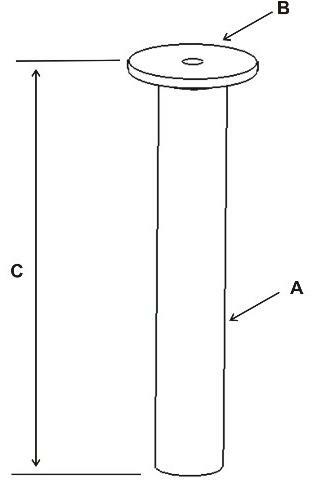 Allows adjustment of tele-pole. Vehicle Base Quick Disconnect: Optional. See RAM-VB-REM1 below. NOTE: Center to Center Hole Seat Bolt Distance is the center hole distance of the two pre-drilled holes in the vehicle base that line up with the vehicle seat bolts. This distance MUST MATCH your vehicle. RAM-VB-REM1 attaches to the vehicle base. This Remove-A-Pole quick disconnect allows the entire laptop system from the vehicle base up to be removed using the quick release pin, no tools required! Perfect for individuals using a vehicle for work and personal use. One of our most popular options. Below are manufacturer component specifications. NOTE: Manufacturer specifications and design can change without notice. Tough Tray: RAM-234-3 Laptop "Tough Tray"
Click here to see the RAM-234-3 parts list. NOTE: The RAM-234-3 tray is pre-assembled. High strength composite spring loaded expandable tray. Accommodates laptops from 10-16 inches wide (screen size up to 17 inches). Includes 4 side clamping fingers with rubber grips. The fingers are fully adjustable and can be moved both vertically and horizontally. NOTE: RAM Mounts recommends the RAM-234-SNMU Safe-n-Secure kit if the Tough Tray is going to secure a laptop while the vehicle is in motion. 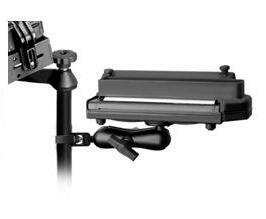 Articulating Swing Arm: RAM-VB-110-1U dual swing arm. Provides 12 inches of total horizontal extension. Black powder coated steel with composite twist knobs. Connects to the Tough Tray and upper Tele-Pole. 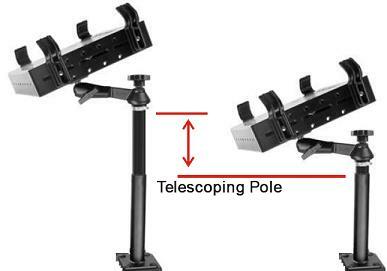 Telescoping Tele-Pole Assembly: Upper RAM-VP-TTM8U and lower RAM-VP-TBF9U tele-poles included. 12 to 18 inch vertical height adjustment range. Tele-Pole may be easily cut with a hack saw to a more desired length. Upper Tele-Pole: RAM-VP-TTM8U black powder coated steel upper tele-pole mates to the articulating swing arm and lower tele-pole. Click here to see the upper tele-pole parts list. NOTE: The upper tele-pole is pre-assembled. Lower Tele-Pole: RAM-VP-TBF9U black powder coated steel lower tele-pole mates to the upper tele-pole and vehicle base. 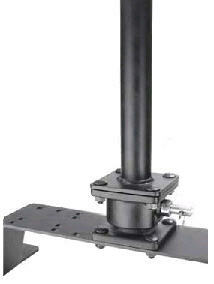 Adjust-A-Pole: RAM-VB-ADJ1 Adjust-A-Pole allows the tele-pole to be positioned away from transmission humps and consoles. Mates between the lower tele-pole and vehicle base. 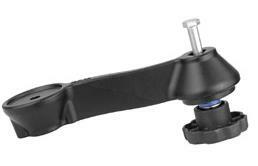 Tele-Pole Options: Click here to see tele-pole options including printer mounts and RAM-VB-REM1 quick disconnect (allows the entire tele-pole assembly to be disconnected from the vehicle base in seconds). Vehicle Base: Vehicle base dimensions is located on the Description tab. NOTE: Click here to view all available laptop accessories. RAM-234-S2U adjustable locking screen support secures the laptop screen to a desired position. Prevents wear and tear of the hinges on the laptop screen from potholes and poor road conditions. RAM-234K1-4U flat side arms allow the laptop lid to close flat in the Tough Tray when not in use. 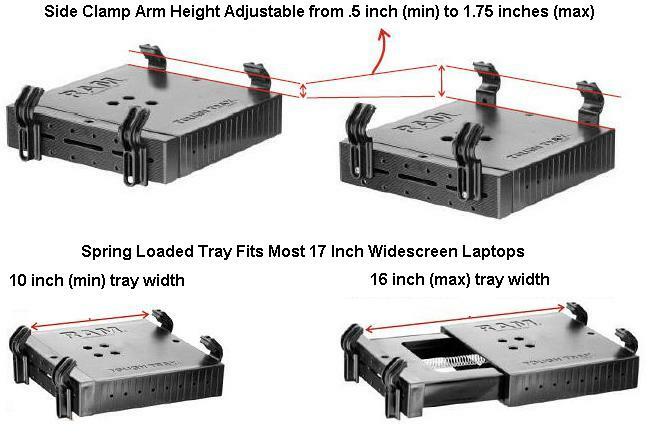 The included Tough Tray arms DO NOT ALLOW the laptop lid to be closed flat in the Tough Tray. RAM-234-5U power caddy secures power adapters and cords. 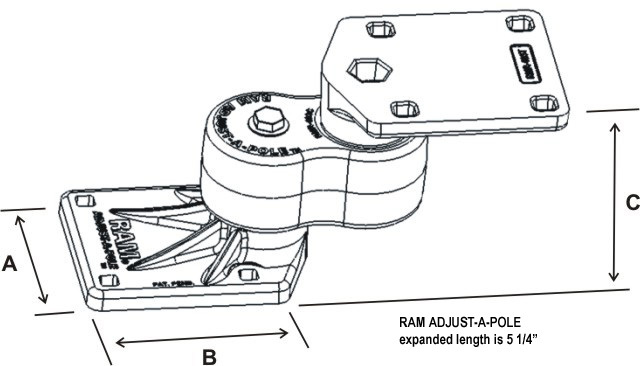 RAM-234-AK1U quick adjust knobs allow Tough Tray retaining arms to be moved easily with no tools. Click here to view all Tough Tray accessories. RAM-VB-109-3U provides an additional 6 inches of swing arm extension. Generally, the standard 12 inches of extension is sufficient. Click here to view available printer mounts. 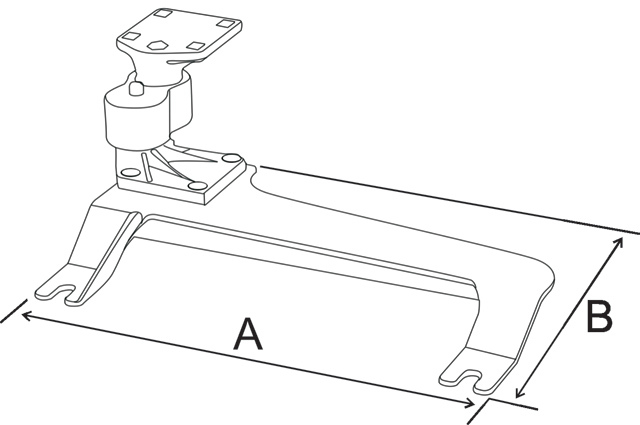 Click here to view available Tilt-N-Turn options. Generally, used for police vehicles. Click here to view all Tele-Pole accessories. Price $363.99 + Free Shipping and Laptop Accessory!